One of my favorite albums of hers. She takes you to many different places through each of the songs on here! I love her guitar work on here too. "Chlesea Morning," "The Fiddle and the Drum" and "Both Sides, Now" on here. I had heard Judy Collins' version of "Both Sides Now as a child, but that all changed a few years ago one night before I went to bed. I was listening to an IHeartRadio radio station that I made, and after playing Judy's version of the song, Joni's version of "Both Sides Now" from this album came on and from that point on, I fell in love with her music and her voice. After that, I became a fan of hers. I now cite Joni's version of "Both Sides Now" from this album as my favorite version! This song belongs to her and ONLY her! That night, she walked into my life at the right time! This album is not as poignant for me as maybe 'Blue' or 'Court and Spark' which took their place in my collection before 'Clouds'; but I have to say 'I Don't Know Where I Stand' is truly outstanding and sets it apart from all other recordings of the time. I have enjoyed moments of solitude and even moments of sharing ideals but what always has remained are the terms of this song echoing and making me face up to what is for me a reoccurring dilemma - who am I? ; where am I? ; where are we? "I Don't Know Where I Stand"---check out Fairport Convention's electric take on this great song on their Heyday record, which I believe is a record of BBC recordings. So after devouring "Song to a Segull" and becoming completely obsessed with Joni Mitchell back in 1970, I had to purchase this album too and tried learning some of the songs in open tuning on my guitar. 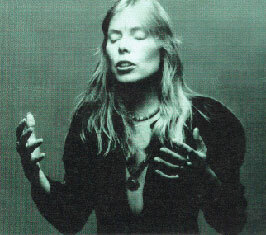 Joni Mitchell's early music will always hold a very special place in my heart.